THE MILO CONNECTION, how Matt Leasegang restored a beaten up old funny bike. It all began with this unknown frame that had been around the traps more than anyone knew. Skip forward to see the completed project which took two years. On the 11th of November 1985 the Queensland Amateur Cyclist's Association made an important announcement to the press at Chandler Velodrome, as they unveiled four new "funny" bikes. A couple of months earlier, on Sunday the 17th of September 1985, at Bacchus Marsh - Victoria, the four bikes had already made their debut at the Australian National Road championships. National Cycling magazine reported the "funny bikes …were little help on the windy and hilly course", one caption read "The Queenslanders mounted on their ultra modern 'Funny Bikes' and superbly dressed were a credit to amateur sport." Jeff Leslie, Kerry Carmichael, Keith Lane and Greg Dwiar finished second to the Victorian team that day, the Victorians setting a new national record. The Victorians recorded a time of 2:07:32 and the Queenslanders a 2:09:11 for the 100km. The tables were turned on the Victorians in April 2006 at a test race in Tasmania, Jeff Leslie, Greg Dwiar, Murray Donald and Stephen Rooney recorded a time of 2.03 for 100km, all four were selected to go to the Commonwealth Games at Edinburgh where they rode a 2:16.41 for fourth place. All the while training and racing on their new Milo sponsored funny bikes. After the official unveiling at Chandler, Freeze Frame Frank Walsh wrote; "The green, white and Milo brown bikes of aerodynamic design were presented to the Queensland team by Peter Kouimanis, Queensland manager of Nestle Australia. Mr Kouimanis, announcing his support for the Milo Target '86 scheme, said - we at Milo are delighted to be involved with Queensland cycling at this exciting stage of their development. We feel they are on the verge of a major performance break-through which will see Queensland cycling dominate, at national level…, our contribution to cycling in this State was into five figures. Cycling is a non-contact, non-violent sport and fits the Milo image and we are confident it will be money well spent." Michael Browning had been appointed marketing manager for Q.A.C.A and forged the relationship with Milo. 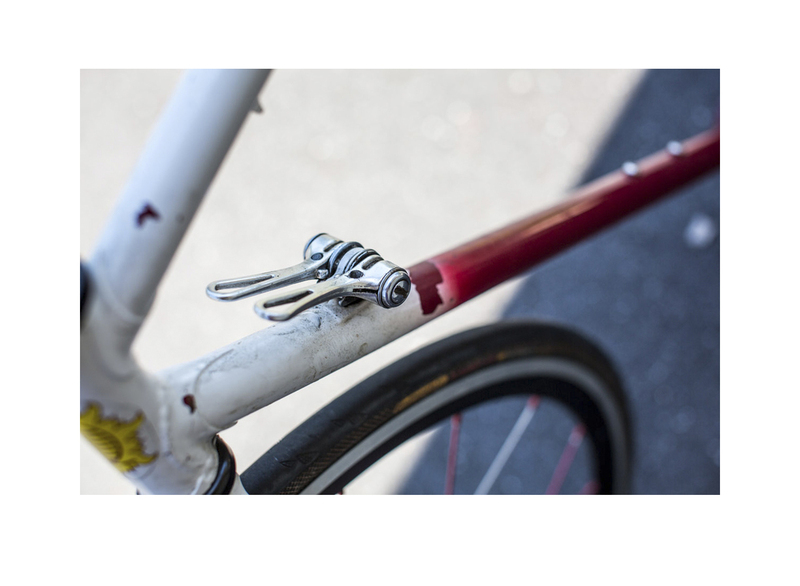 Fast forward to this week and I received a message from Matt Leasegang, a local pro photographer and fixie fanatic. Here's where the old world of bike racing collides with the new world of dogged, fanatical bike collectors. Matt sent in some images of a bike he's found and wanted to know it's history before making any decisions on what gear to run on the bike and paint colours. Keen not to ruin the bike and to find out as much as he could Matt asked if I could help possibly track down the original owner. Where do you begin with just a few pictures of an old mid eighties funny bike that looks like it's had more coats of paint than the Sydney Harbour Bridge. Only a couple of hours later and we'd solved Matt's puzzle. Last year Murray Donald helped with a post about the 1986 Australian road teams time trial team that raced at the 1986 Commonwealth Games in Edinburgh - sounds familiar. 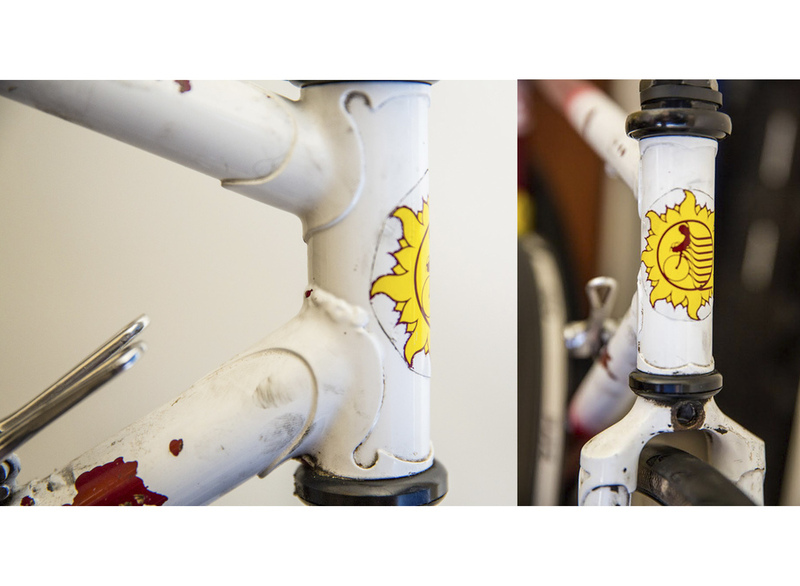 It turns out that the very bike that Matt plans to restore was ridden by either Murray himself, or Greg Dwiar. I think it was built in 1985, there were 5 built, (3 Medium, 1 Large, 1 Small) and I think the build was organised by Mick Glindermann who was the Queensland Road Coach. I recall the Queensland Team used them in a test event for 1986 Commonwealth Games 100K Road Teams Time Trial, I am pretty sure the four riders who raced that selection event and won were Jeff Leslie, Murray Donald, Greg Dwiar and Steve Rooney. Then Matt got in touch with me, I took one look at the old Queensland Amateur Cyclist's Association logo which was still emblazoned on the head tube, saw that it was a funny bike and asked Murray what he thought. Murray got back to me with this. Sunny Queen Eggs sponsorship of the Queensland team. Within a day Matt had the history of the bike and the name of the possible original rider, plus it's history as a Queensland then Commonwealth Games race bike. Murray then came up with an exact components list, plus the original paint scheme and the type of wheels used in competition, borrowed from the Australian track team. Next Matt's going to re-paint and fit out the bike exactly as it was as a "Milo" team bike. Suffice to say Matt's ecstatic that he has found an old steel funny bike that was a sensation when it was unveiled as the latest and greatest. It's also interesting to note the refusal of new technology at the time by others - "funny bikes …were little help on the windy and hilly course". The Queenslanders were leading at the cutting edge in their thinking and attitude. I was present during that period and raced on teams with and against some of the Queenslanders. Anyone who was there will know what I mean - there was a certain buzz and excitement of the new level of professionalism the Queenslanders were bringing to the sport in this country. Now that Matt has brought this bike to my attention, I know it's gone to the right person, who'll bring it back to life with care and attention to every detail. Matt we're all looking forward to your finished work, although I'd have to say - Matt you're restoring a bike that's copped one hell of hiding there! 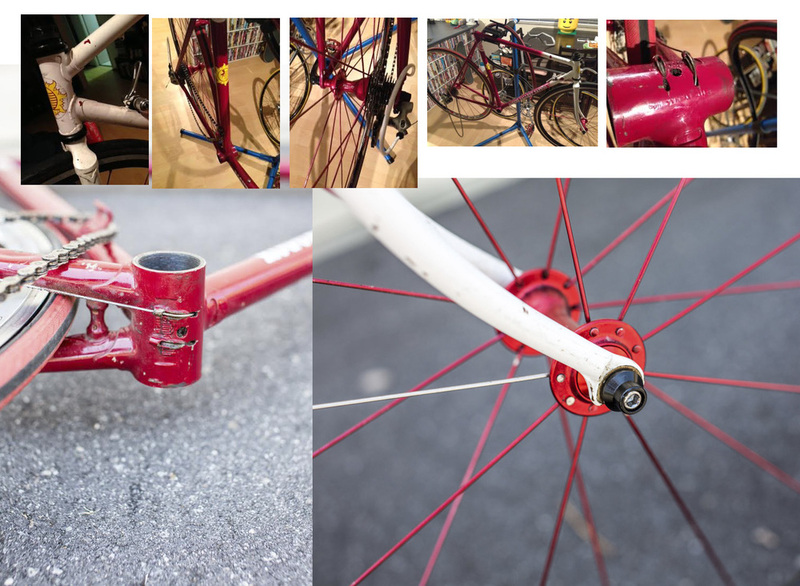 All Photos of Matt's Milo Bike before restoration, by Matt Leasegang.